How do you create a photo mosaic using your own photos? Watch our video for simple tips to success. How do I make a Mini-book using RTC Grid Paper? With a few score lines and one simple cuts you too can create this project in an afternoon. 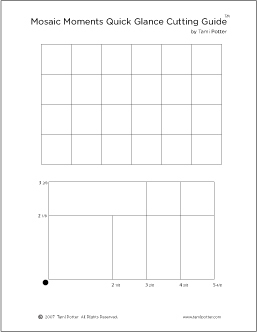 I’m going to show you the scoring and cutting on a White 4x6 RTC grid paper then finish the project with the Brick 4x6 RTC grid paper. Here you can see that I have scored on the four inch and eight inch lines, then rotated the grid paper and scored on the six inch line. I then cut two of the 4x6 grids on the six inch score line and left one scored. This is the only cut you need to make to create this mini album. Now on to folding, adding the front and back covers then adhere the pages together. You will need to make crisp folds with a bone folder. In the next photo you will see where I applied the adhesive. You will need two 4 ½ x 6 pieces of paper for the covers and two 4x6 pieces of paper for the inside unless you use card-stock or double-sided paper. Score on the 4 1/2 side, 1/2 from the left side for the front and 1/2 from the right for the back cover. Be sure to check that your pattern paper is in the correct position if it has words or a specific direction it needs to be facing. I left the tops of my pages open to accommodate tags for journaling or more photos. You will now adhere the 4x6 papers, one to the front inside and one to the back inside. To make the spine cover you will need a 3 ¼ x 6 piece of coordinating paper, ribbon or other spine embellishments. Score on the 3 ¼ side at 1 ½ and the 1 ¾. 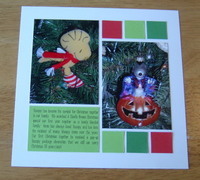 Now that the album is assembled you will need to decorate the inside covers and pages. I used the Clearly Love Seals stamp set to carry out the Love theme for this project. I'll be sneaking around and taking photos of my son and husband over the next few weeks before Valentine's Day arrives to add to these cute mini albums. Supplies used: Mosaic Moments RTC Grid Paper, Clearly Love Seals stamps, McGill punches, Tsukineko Ink, Making Memories mini heart brads and photo corners, Cloud9Design Be Loved pattern paper by Fiskars, and ribbon. I found some wonderful paper and sticky embellishments from Basic Grey (one of my favorite decorative paper companies) and I knew it had a "Project for Cole" written all over it. One of the embellishments had the quote, written above, by Albert Einstein on it - a perfect place to begin! page 1 - Imagination - love this quote. Cole is ages 3 & 4 in this little book - I wanted to celebrate him at this very imaginative age. Page 2 - Children love to see their name - so I dedicated one full page to "COLE"
pages 3-4 - playing is the foundation for imagination. Page 5 - Imagination is simple - just stop and let your mind wander. page 6 - A good imagination is always better with support from those you love. page 7 - sliding down the tongue of a whale... great props are wonderful for assisting the imagination. Page 8 - Cole's list - to remember the things he likes to do at age 3-4. How do I clean my Mosaic Moments Mat? It is easiest to clean the "goo" off of your mat immediately after use. The longer the adhesive residue is left the more aggressive the adhesive becomes. I squirt a little Goo Gone on my mat and let it sit for a few seconds before rubbing in a circular motion until all adhesive has been dissolved. Then, I use a second paper towel to dry the mat. PLEASE NOTE: Do not use solvents or abrasive products on your mat. They may damage the printed surface. Why should I use a Mat and Knife to cut my photos? Our Mosaic Moments cutting mat and a craft knife is actually faster & friendlier, for cutting photos into one inch squares, then using a square punch. In my step by step instructions, (book page 14) step one is to apply Herma Dotto removable adhesive - I recommend four lines of the adhesive because you want to get a little glue on every inch of your photo. 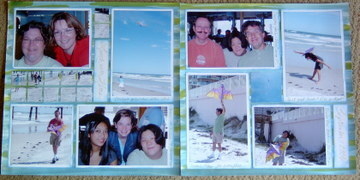 The adhesive will keep your photo in place on your mat and allow you to (step two) quickly cut the photo. Faster: Instead of thinking of cutting each individual square - think about cutting strips. After applying adhesive, place your photo on the Mosaic Moments self healing mat (lining it up with the grid lines.) Cut one inch strips in one direction, turn your mat, and cut one inch strips in the other. Using this method cutting is quick and easy. Friendlier: When you finish cutting, your photo will be sectioned into one inch squares that are temporarily stuck to the mat - each piece remains in its proper order - ready to be transferred to the grid paper. Is it possible that WHITE could be your favorite grid paper color? Now, it is not only possible but very likely! Thanks to our newest discovery, Walnut Tintz and Ink by Fiber Scraps, you can quickly create a handmade, custom grid paper that suits your photos and your mood. "paint" stripes across the page running off the side of the paper onto your scrap paper. 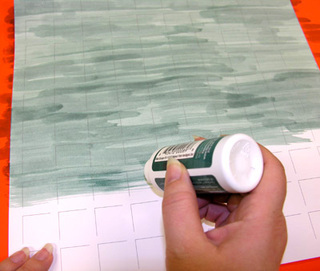 use the tintz to ink the edges of your paper tiles, tags and Cornerstone backgrounds. We would love to see what creative uses you discover. Tell us or send photos to contactsnc@msn.com. We LOVE seeing what you are doing. It truly makes our day. So, if you are even thinking about sharing with us, please do. We encourage you to post your pages on our Mosaic Moments facebook page. Just click on the facebook button and go to "photos" to add your Mosaic Moments Designs. If you don't have a facebook account it is easy & FREE to start one.